Doe Run! Lovely home with stacked stone gas log fireplace, cherry floors and cabinets, stainless appliances and very private backyard! 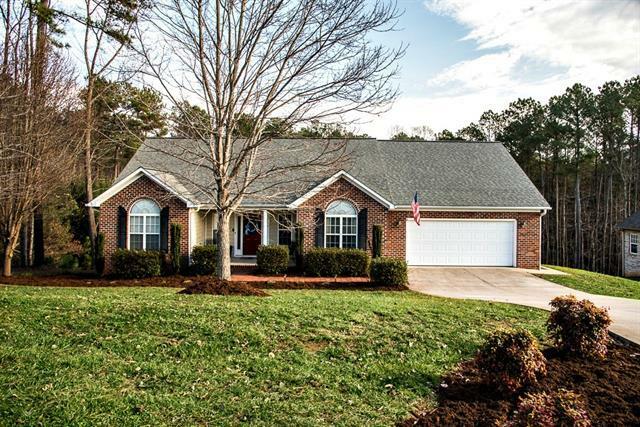 Buyers will love the covered back deck & large, fenced yard. Enjoy watching the deer and turkey and surrounding change of color while sitting in your backyard! Main level living features a split floor plan with two secondary bedrooms and bath and very large master suite situated on the opposite side of the home! Master features large jetted tub, separate shower and walk-in closet, as well as access to the deck. Kitchen has abundant counterspace and cabinets, pantry and easy access to the great room, deck and formal dining room. The finished basement has abundant storage, a large family room and an office with exterior access, closet and a full bath. It is could be used as a 2nd master bedroom, but isn't counted in the bedroom count due to the septic permit for a 3 bedroom. Unfinished basement workshop space with exterior access, too! Sold by Berkshire Hathaway Hickory Metro Real Estate.